These traditional-style guest chairs feature four rolling casters which make them exceptionally easy to transport. Their unique style is sure to enhance your office décor. 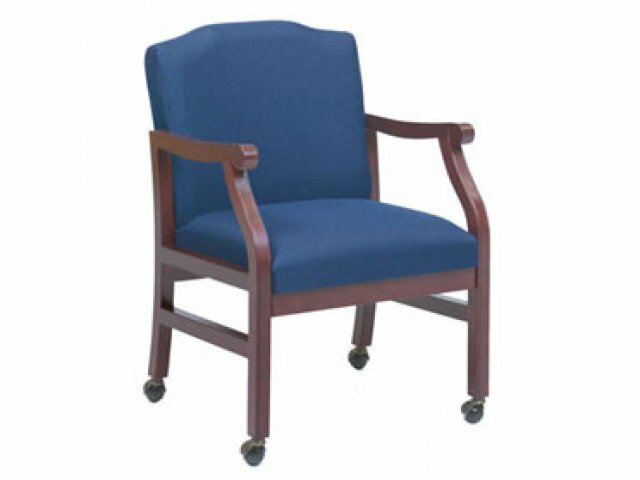 Lesro Solid Wood Guest Chairs will add a dignified charm to your waiting room, reception area or executive office. They feature 1 1/2"-wide armrests styled in a contoured traditional rolled-arm design.Their classic appeal is highlighted by a huge selection of attractive fabric upholstery choices, accented by a variety of wood finishes. 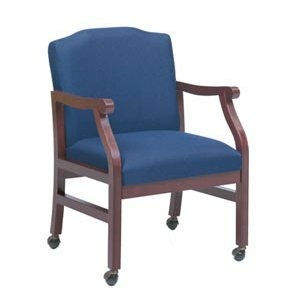 These comfortable reception chairs are durably constructed for long-term enjoyment. They have plush layered backs and seats which are held firmly in place by a Matrex seat support system. The solid maple wood frames of these guest chairs feature double-doweled construction, reinforced by interlocking steel components. Traditional Styling: The 1 ½”-wide arms feature a rolled-arm design which lends a classic charm to these chairs. Padded: These chairs feature 4"-thick foam seat padding and 3 1/2"- thick backrest padding. Solid Materials: Wooden chair frames are made from solid maple. Tough Construction: Interlocking steel pieces provide tough support to the double-doweled frames and Matrex seat support system. Attractive Finish: The five-step hand-rubbed finish is available in a selection of appealing hues.